Well, I'm a little late to the Scrappy Trip Along party but I finally finished my quilt top. I love it! I can't wait to get it quilted and snuggle up under it. I am pretty sure this will not be the last of my scrappy trip along quilts, I loved seeing how each block would turn out. When I first started sewing the strips together I was having a hard time just randomly sewing the strips together (I really wanted each strip to match but that isn't what would make this quilt pop) so I got my 9 & 7 year old girls to help me choose the strips and I have to say they did a great job not matching anything. Ha! I did position the dark strip in the same place in each block and I really like how it turned out. My latest sewing adventure has been branching out from quilts and into sewing little skirts. A lady, Sherry Whitman, from my church visits El Salvador multiple times each year doing missions and she came to talk to the GAs (Girls in Action) class that I teach and told us about how poor the families are and how badly they need clothing. As I was sitting there listening to her I remembered reading on Randi's blog about her Sewing Seeds project and I feel like God placed it on my heart to sew skirts for Sherry to take on her next trip to El Salvador. I told my friend Sharon about it and she immediately made the two green skirts in the picture and just last night I made the pink and purple ones. I definitely have a lot more to learn about making clothing but it was way easier than I thought it would be. I followed this tutorial on the dana-Made-it blog and it really was simple to make. I don't know how many skirts I will make but I however many I make I pray they will go where they are needed most. 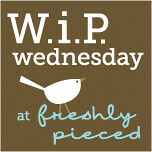 I am linking up with Randi's show and tell Tuesday...it's a great way to see what other people are working on. Your scrappy trip looks great! Isn't it amazing how every single one of those quilts turns out so cool? ABSOLUTELY LOVE your quilt! The colours are really great. Love that quilt! I am about to put mine on the quilting frame. It will be my first one on the frame. I want the scrappy quilt so sen it this way ASAP. The skirts are so cute, what a great idea. Maybe I can hit Melissa for a few dozen...you never know with that girl. I love the quilt! Placing the dark strips like that is really striking :) Those skirts are adorable, too. They will make their recipients happy, I think! Your quilt is gorgeous and way to go on the skirts! I know they will be a blessing. My MIL is a missionary in Malawi, Africa, and we had a sewing bee to make dresses for her to take back for the orphans she ministers too...every little bit helps. Your Trip Along took my breath away it's so beautiful! and I'm so impressed with the way your helpers pitched in to make such a lovely quilt with this memory! Bless your heart, and your friend's...and the lil' girls who will wear such pretty skirts! You have an amazing heart! Your quilt top is absolutely gorgeous and the skirts are so cute. How nice of you to make them.